Shah Rukh Khan's eldest son Aryan Khan has a fan following of his own. Though he doesn't make much public appearances, his good looks are enough for him to set a fan base that he currently enjoys. The 21-year-old celebrity kid who is yet to make his Bollywood debut posted few pictures from his France vacations and in no time they broke the internet. 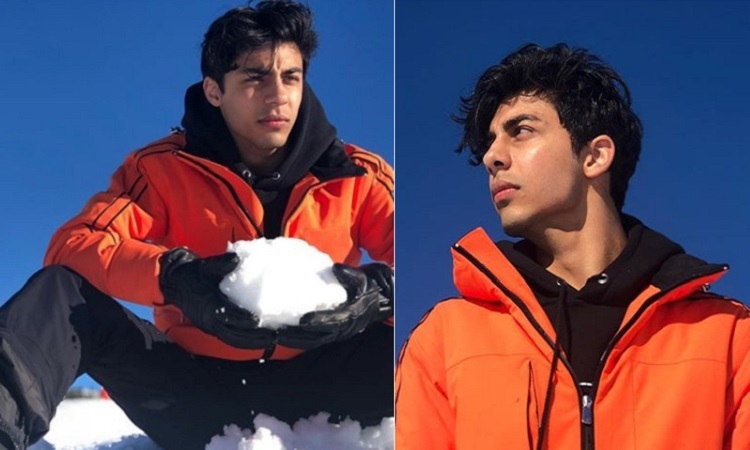 In no time, Aryan Khan's fans started gushing over these images and one of them commented, "Made my morning so blissful". One more fan quipped, "My heart skipped a beat" while the other wrote, "His jawline ohhh my goddd". Aryan's superstar dad King Khan Shah Rukh Khan is often questioned about his children's potential future in Bollywood. While, SRK has revealed that daughter Suhana Khan is sure taking up acting, Aryan is more inclined towards film making. "Aryan is studying to be a filmmaker and a writer, while Suhana wants to be an actor. But even if he wants to be a filmmaker, he needs to study for another five to six years and not just the literal form of studying, but probably be an assistant to Karan after he finishes his film-making course", Shah Rukh Khan had expressed in an interview. Meanwhile, let us enjoy these handsome stills of Aryan. Let us know what your views are over these photos in the comment section below. Sonam and Janhvi Kapoor Made For A Gorgeous Date For Each other!! Sanjay Dutt wears 35 Kg armor for Panipat!